The 10th of August 2017, was a magnificent day for us at SELL office RT. REV. MSGR. HILARY NANMAN DACHELEM, CMF, the chief Shepherd of Bauchi Diocese alongside some priests of the Diocese visited the Foundation. During the visit, he encouraged the SELL Team to continue the good work. He remarked that one of the major problems confronting Nigerian youth is lack of appropriate knowledge, he promised to partake in SELL Programme. The Board of Trustee Members (BOT) and Staff of Sharing Education and Learning for Life (SELL) Foundation wish to felicitate with the Arch-Bishop, Diocesan Administrator, Priests, Religious and the entire Lay Faithful of Catholic of Jos Province over his appointment as the 3rd Catholic Bishop of Bauchi Diocese. We are pleased that he has been chosen as the chief shepherd of Bauchi Diocese at a pivotal time when the Church is working towards redefining its evangelization role in the society since the death of the late bishop Malachy Goltok of blessed memory. We assure you of our solidarity in ministry with the Youth, vulnerable groups and the Church at Large church through our Programmes for Young Adults and vulnerable groups in the Church. Similarly, The Board of Trustee of the Foundation (BOT) meeting took place on the 15th August 2017, at the Youth Formation Centre Bauchi. Their meeting was intended to ratify some policies of the organization and deliberate on issues regarding the growth of the organization. The BOT is the Legal holder and the highest decision- Making body of SELL. They provide broad oversight functions as well as corporate Leadership and governance for the organization. Immediately after the meeting, a delegation led by Fr. 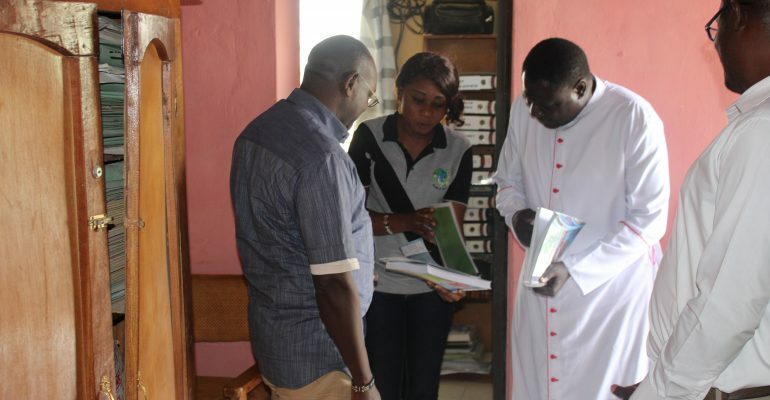 Emmanuel Likoko who doubled as the BOT Chairman and the Assistant West Africa District Leader of St Patrick’s Missionary Society (SPS) accompanied by the Director of the Foundation (Fr. Patrick Esekon), Mr. Moses Alopka (BOT member), Beji Benjamin Jibe (Team Leader) and Mary James (Admin Officer) paid a courtesy visit to the bishop at his residence. During the visit, the delegation congratulated him over his appointment as the new bishop of Bauchi. The BOT chairman spoke on behalf of the Foundation as he reiterated the assurance of the Foundation’s allegiance to the bishop while presenting the Strategic plan of the Foundation to him. The bishop warmly received the delegation and affirmed the work done so far, stated that Strategic Plan is good because it helps in planning. We are looking forward to collaborating with his lordship, we thank the Church in Bauchi for the unfailing support, it is our sincere prayer that the Diocese continues to thrive.